Excellent Weather – It’s best to install a roof on clear days when the temperature is above 45 degrees. This allows the asphalt shingle seal strips to melt and adhere properly because of the ambient warmth, leading to better and more secure installation. It’s also safer and more comfortable for our team to work on your roof when it’s not excessively cold or hot. This allows us to do our best and provide better workmanship. Winter Preparation – Winter will make any existing small leaks or holes in your roof worse. The snow and ice will allow moisture to easily enter your roofing system and cause costly damage. If your roof is not in great condition, the weight of heavy snowfall can also cause damage. 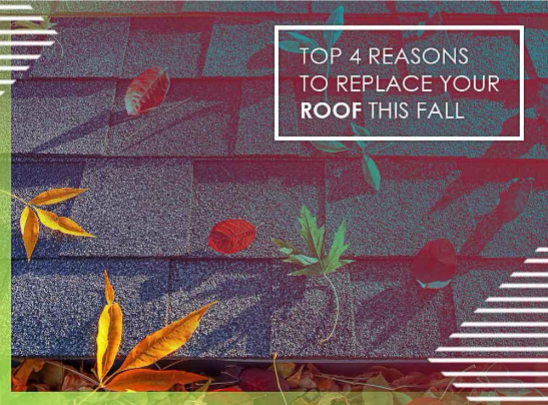 It’s important to prevent this from happening by replacing your roof before winter arrives, and fall is a great time for this roofing project. Summer Damage – Summer’s rain, sun, wind, and storms can cause significant damage to your roof, especially if it is already old. It’s prudent to schedule a roof inspection to check for problems and replace your roof as soon as possible, if it is necessary. The sooner you deal with your roofing system’s issues, the better. Easier Installation – The cold temperatures during winter make it difficult to install asphalt shingles properly. They have a tendency to become brittle and that’s why many shingle manufacturers recommend that roofers install their products at temperatures of 26 degrees or higher. Cold temperatures make it easier to break a shingle when fastening it, so it’s in your best interest to replace your roof when the weather is still agreeable. Innovative Roofing and Siding can help you with your upcoming roof, gutters, and siding projects. We have many years of experience helping local homeowners maintain and improve their homes. We focus on providing on-time service, quality workmanship, and affordable prices to all of our customers. Innovative Roofing and Siding serves many areas including Knoxville, TN, and the surrounding communities. Call us at (865) 444-6070 to learn more about our services and products. You can also ask for a free estimate.